Mangas Coloradas (1793?-1863) – Chiricahua Apache leader considered by many to be the most important of the 19th century, uniting the Apache nation against the United States. See Article HERE. Manuelito (1818-1893) – A principal Navajo war chief, Manuelito and his followers were the last of the Navajo tribe to be forced onto a reservation. See Article HERE. 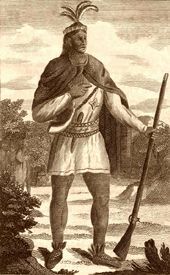 Metacomet (1639?-1676) – Also known as King Philip or Metacom, this war leader of the Wampanoag tribe was the second son of Chief Massasoit and led an alliance against white settlers to push them out of New England in what is known as King Philip’s War. See Article HERE. Nah-deiz-az, aka: “Carlisle Kid” (1865-1889) – A so-called Apache “outlaw,” Nahdeizaz is often confused with the “Apache Kid.” See article HERE. Naiche (1856?-1919) – Son of Cochise, he led the Apache along with Geronimo in resisting white encroachment. See Article HERE. Nana (1800-1896) – An Apache War Leader that led a band of warriors in New Mexico when he was already more than 80 years old. See Article HERE. Old Crow – Old Crow was allegedly one of the members of the Dull Knife band of Cheyenne, which left the reservation in Indian Territory and made the memorable raid across Kansas in September and October 1878. See article HERE. Old Man Afraid of His Horse (1808-??) – A noted Ogallala Sioux warrior, Old Man Afraid Of His Horse was also known as Tasunka Coquipah. He was born in Lakota Territory in 1808 and married Medicine Woman in about 1856. 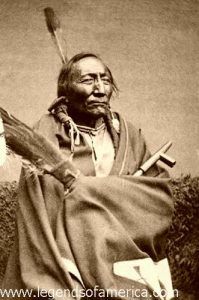 He witnessed the Treaty of Fort Laramie when Dull Knife signed the document in 1868. This treaty guaranteed the Lakota ownership of the Black Hills, as well as more land and hunting rights in South Dakota, Wyoming, and Montana. This region was to be henceforth closed to all whites and ended Red Cloud’s War. However, when gold was found in the Black Hills, more and more white settlers invaded the territory which led to the Black Hills War. Opechancanough (1545?-1644?) – A Powhatan chief, he was the brother of Chief Powhatan and upon his brother’s death in 1818 took control of the Powhatan Confederacy. See Article HERE. Chief Osceola (1804-1838) – Born as Billy Powell, he became an influential leader of the Seminole in Florida. See Full Article HERE. Chief Ouray (1833-1880) – Born near Taos, New Mexico, Ouray was the leader of the Uncompahgre band of the Ute tribe and known as a man of peace. See Full Article HERE. Quannah Parker (1845?-1911) – The last Chief of the Quahadi Comanche, Parker was both a major resistor to white settlers, as well as a leader in the tribe’s adjustment to reservation life. See Article HERE. King Philip – See Metacomet. Susan La Flesche Picotte – First Native Physician. See Full Article HERE. Pocahontas (1595?- 1617) – A Powhatan Indian Princess, she was for having assisted colonial settlers at Jamestown and allegedly saving the life of the colony’s leader, Captain John Smith. See Article HERE. Chief Powhatan (1545-1618) – Known as Wahunsunacawh to the Powhatan tribe, he founded the Powhatan Confederacy in Virginia, assembling a total of about 30 tribes by the early 17th century. See Full Article HERE. Chief Pohibit Quasha, aka: Iron Shirt (18? ?-1858) – In the 1850’s fearless bands of skilled Comanche warriors were busy raiding white settlements and Mexican ranches of Texas and Oklahoma at will. One of the marauding bands was led by Chief Pohibit Quasha, better known as Iron Shirt. Described by many to have almost supernatural abilities, the cunning and ruthless warrior was seemingly immune to bullets. Several pursuers told stories of how they had shot him numerous times with no effect. However, when the governor hired 100 new Texas Rangers in 1858, the time was near for Iron Shirt. In what was called the Antelope Hills Expedition, led by John Salmon “Rip” Ford, a force of some 100 men began to go after the marauding Comanche bands. On May 12, Ford’s Rangers, along with Anadarko and Shawnee scouts pursued the Indians into the Antelope Hills in what is now Oklahoma. Coming upon a Comanche village in the Canadian River Valley, they soon attacked the village and Iron Shirt was killed by an expert Indian marksman named Jim Pockmark. Carrying a .58 caliber Henry buffalo rifle, the Indian scout waited for his chance and shot Iron Shirt when his mount was turned sideways. Afterward, it was found that Chief Iron Shirt didn’t actually have any “Indian Magic” protecting him from the several shots he had received in the past, but rather had been wearing an old piece of iron chest armor from the early Spanish conquistador days. After the battle was over, the Rangers reported four casualties, killed some 76 Comanche, and took 18 prisoners.